Advanced moisturizing formula targets the three top aging concerns of the delicate eye area; designed to instantly hydrate and smooth fine lines, brighten dark circles and reduce puffiness. Advanced peptide (2% Haloxyl) complex helps prevent and diminish the appearance of dark circles by 19% after 56 days of use. Improves elasticity to reduce the appearance of fine lines and wrinkles. Advanced peptides (3% Matrixyl 3000) improve wrinkle depth up to 45% after 56 days of use. Water, PentyleneGlycol, Cyclopentasiloxane, Glycerin,Cyclomethicone, Isopropyl Palmitate,Dimethicone, Dimethicone Crosspolymer-3,Carbomer, Butyrospermum Parkii (Shea Butter),PEG-40 Stearate, Cholesterol, SorbitanStearate, Hydroxyethyl Acrylate/SodiumAcryloyldimethyl Taurate Copolymer,Butylene Glycol, Dimethiconol, Squalane,Retinyl Palmitate/Carrot Polypeptide,Phenoxyethanol, Steareth-20, HydrolyzedAlgin, Palmitoyl Tetrapeptide-7, PalmitoylOligopeptide, Benzyl Alcohol, SodiumHydroxide, Sea Water, Polysorbate 20, SodiumBenzoate, Potassium Sorbate, ChlorellaVulgaris Extract, Disodium Edta, EpilobiumAngustifolium Flower/Leaf/Stem Extract,Tocopherol, Xanthan Gum, TetrahexyldecylAscorbate, Salicylic Acid, Dehydroacetic Acid,Benzoic Acid, Chrysin, N-Hydroxysuccinimide,Polysorbate 60, Benzethonium Chloride,Glyceryl Acrylate/Acrylic Acid Copolymer,Saccharomyces/Copper Ferment, Saccharomyces/Zinc Ferment, Saccharomyces/Silicon Ferment,Saccharomyces/Iron Ferment, Saccharomyces/Magnesium Ferment, Lavandula Angustifolia(Lavender) Oil, Evodia Rutaecarpa Fruit Extract. I enjoyed the product itself but I did not like the pump (always came out too much ). If it were in a jar I would buy it again - I prefer Caviar eye cream. I am not yet sure about the brightening capabilities of this product but otherwise, it does what it says - reduces puffiness, fine lines etc. I have a fine line that appears whenever I haven't had enough sleep and with this cream it disappears. You do have to be quite careful with the pump as too much product comes out. I noticed a reduction in my dark circles within a week of starting this product. 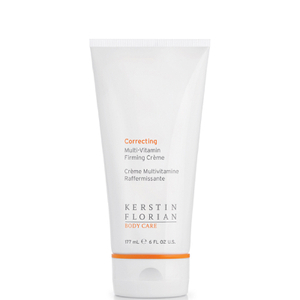 It is the best eye creme that Kerstin Florian makes!